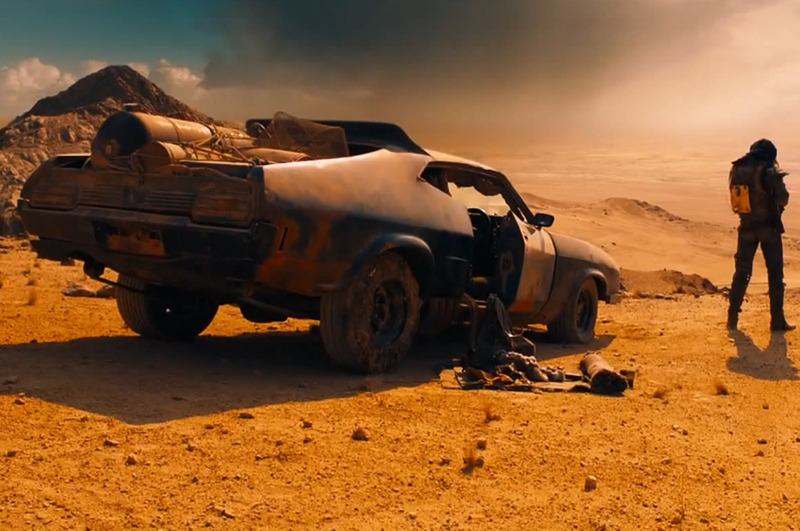 Thirty years beyond the Thunderdome, George Miller has retooled and rebooted the Mad Max franchise. Indy Datta swigs the guzzoline. The paradox of the Mad Max films is that, although their stories are officially driven by post-apocalyptic scarcity, the experience of watching them is defined by spectacle that should be logically impossible in the context of such scarcity. Revisiting the earlier films before watching Fury Road, there were times when I couldn’t resolve the contradiction: the arbitrariness of the world-building often worked against any urgency in the plotting, and the continuity from one film to the next is both obscure and insisted upon (although I will always be delighted by the way that post-apocalyptic Australia in the first film is just… Australia). Fury Road powers past any such nitpicking in a gigantic armoured battle truck, with an albino mutant strapped to the front of it playing metal riffs on a twin necked guitar with a headstock-mounted flamethrower. Metaphorically speaking, of course. No spoilers here. Like its predecessors, Fury Road comes with a convoluted backstory on paper (or on Wikipedia) that sometimes is and sometimes isn’t reflected on screen. But you don’t need to know any of it. Although the film’s villain may have a name (Immortan Joe, played by Hugh Keays-Byrne, who also played the first film’s “Toecutter”) and, in theory, motivations, you don’t really need to know about either of those things. In a time when the most successful blockbuster action films can feel like prisoners of their increasingly convoluted franchise continuity, Fury Road – from its recasting of Max onwards – gives you permission only to care about what’s on the screen right now. All you need to know is this. Because apocalypse: cars. Miller’s first collaborator on Fury Road was the British comics writer and CGI artist Brendan McCarthy (the creator of the visuals for ReBoot, the first CGI TV series). Together, rather than writing a screenplay, they created a storyboard of 3,500 panels, which was then turned into a script with the help of the third writer, Nick Lathouris. Miller’s realization of his script is both meticulously legible and (with the astonishing practical stuntwork aided by the latest and most sophisticated crane cars and other cutting edge technology) endlessly, breathlessly spectacular. What most significantly sets it apart from the competition is the skill with which he balances that spectacle with human scale and human stakes. Tom Hardy, taking over the role of Max from Mel Gibson, brings his usual blend of intimidating physical presence, disarming vulnerability, and imaginative accent (I think I’ve read an interview with him where he says he can’t help picking up accents from people around him, which might explain the South African overtones here – the bulk of Fury Road was shot in Namibia and South Africa). He’s the title character here but Charlize Theron’s Furiosa is his equal. A quickie first-look review like this isn’t the right place to fully explore Fury Road’s feminist bona fides and what it all means (and an over-earnest exegesis seems beside the point to me in the face of the film’s hallucinatory, free-associative intensity), but I would note that Max has, since The Road Warrior, been as much catalyst as protagonist in his own franchise, and the last word in each story has gone to the people who’ve found strength of their own because of him (in The Road Warrior, they even find some of that strength in duping their saviour into acting as a decoy in the final act). Rewatching the earlier films recently and then seeing Fury Road has crystallised another paradox of the series for me, which is that in Miller’s grotesquely maximalist post-everything worlds, Max, with his quiet , stoical dignity and his readiness to fight for the underdog, is obviously just about the sanest man still alive. Department of I am an idiot: Furiosa’s the title character as well, of course. My theory is that yeah there WAS a fuel shortage and then everyone died, so on a per capita basis there’s plenty left for doing burnouts in the desert.